Dandy Walker Malformation is the most common posterior fossa malformation. It is characterized by the neuropathologic triad of (1) complete or partial agenesis of the cerebellar vermis, (2) cystic dilatation of the fourth ventricle; and (3) an enlarged posterior fossa with high position of the tentorium, lateral sinus and torcular [1,2]. It has an estimated prevalence of approximately 1 per 30,000 births and it is found in 4% to 12% of cases of infantile hydrocephalus [3-5]. Dandy Walker Malformation is associated with genetic syndromes  because approximately 50% of cases diagnosed prenatally were caused by a chromosome abnormality,  however; the etiology is unknown, though attempts have been made to produce it in laboratory animals . Cerebellar brain malformations have a high prevalence of neurological, developmental, and functional disabilities involving motor, cognitive, and social behavioural deficits that correlate in general with the degree of reduction in cerebellar volume. Lesions of the cerebellar vermis are independent predictors of expressive language and gross motor delays . A Polish 5-year-old boy, who was diagnosed with Dandy Walker Malformation at the age of 1.0 by the paediatric neurologist, was born in the 39th week of pregnancy by C-section with weight of 3650 g and 7/7/9 Appgar/. The infant was incubated for the first 5 days. The structural deformation of oral cavity (the high palate) caused difficulty with sucking and breastfeeding. The USG during the pregnancy showed the increase of fluid spaces near the head of foetus. The USG of peripheral nervous system at the age of 4 and 5 months revealed the increased cranioventricular index (35% and 43%). Since the age of 3 months the has been rehabilitated due to reduce muscle tension. The boy had ophthalmology consultation due to strabismus. The MR imaging scan was made at the of 9.0 months, showing the width of ventricular system, the width of hypoplasia of cerebellar vermis and the width of pericerebral fluid spaces in the frontal region (to 9 mm) and temporal region (to 14 mm). Electroencephalography was measured at the age of 3.11 years (Figure 1). Pre-sleep stage is dominated by beta-rhythm. The temporo-parietal sites consist of the theta-rhythm with the frequency in range 3-4 Hz. Frontal-central site of the right hemisphere consists of synchronous sharp-waves of 300 uV in amplitude and a single sharp slow wave. The bioelectric features of sleep are poor. Sleep spindles are short and rare. 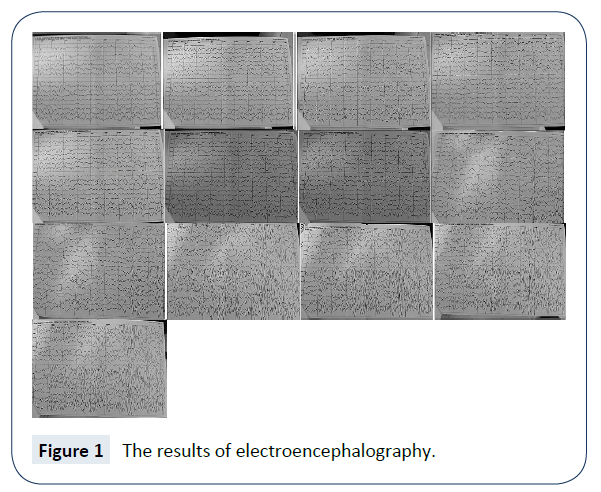 Figure 1: The results of electroencephalography. At present, the visual-motor integration disability, eye-hand coordination difficulties, reduce muscle tension, perceptual-motor problems, difficulty with understanding a cause-and-effect relationship, visual processing deficits are observed. The boy (Figures 2 and 3) was diagnosed at the age of 4.1 by speech and language pathologist. The high palate has not been repaired (Figure 4). 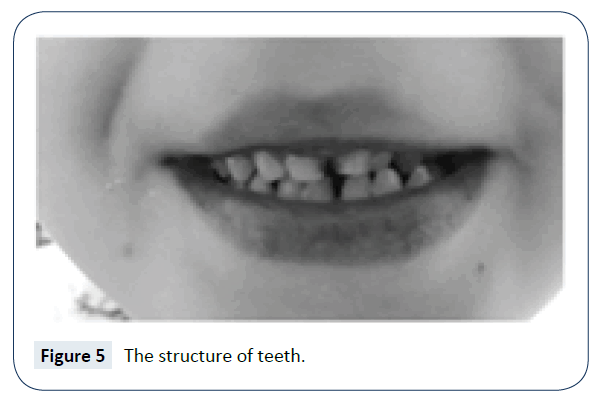 There is also abnormal occlusion (Figure 5). Other structural changes in the organs of speech, i.e. tongue (Figures 5 and 6) and lingual and inferior labial frenulum, do not occur. The oral diadochokinesis rate is incorrect. The motor development is serve delayed. Figure 2: Image of a boy A. Figure 3: Image of a boy B. 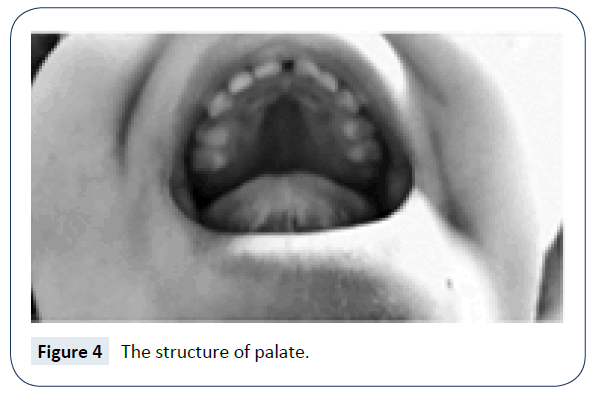 Figure 4: The structure of palate. Figure 5: The structure of teeth. Figure 6: The structure of tounge. Communication functions, i.e. behavioural regulations, social interactions, joint attentions, are initiated with physical manipulations, giving, pointing, showing, gaze shifting, head nodding/head shaking, vocalizations, creating one-word (nouns). Communication skills are limited. The boy is not able to negotiate, refuse, resolve own conflicts or ask for help in a socially accepted way. Those problems cause the irritation and sometimes aggressive behaviour, such as throwing toys or pushing other children. The emotional states are not communicated verbally. Language development is delayed. The first words (/mαmα, tαtα, pα-pα/) occurred at the age of 3.0. The receptive language is below the appropriate level of mental age. Common and concrete nouns, elementary verbs, few adjectives, yes-no questions and Wh-questions (who? what? where? which? ), personal and possessive pronouns are understood, however, simple commands, requests and following verbal instructions are not executed. The expressive language is disordered (ICD-F80.1). There are problems with vocabulary, naming, producing simple sentences, counting 1-10. Speech sound development is also delayed and there are abnormalities in articulation. There can be observed deletions of [f, w,], [h], [l] sound, substitutions of [k, g] → [d, t], [i] → [j]; [p] → [b, m], [s, z, t͡s, d͡s, ɕ, ʑ, t͡ɕ, d͡ʑ, ∫, ʒ, t͡∫, d͡ʒ → [soft sounds] and additions of syllables . The auditory perception is correct. The aim of speech and language treatment is the development of verbal communication skills and social competence. The treatment has been given since June 2017; 2 sessions/week 45 minutes long’ totalling 8 sessions/month. An educational therapy is provided during his attendance at nursery school by special education professional. In the first 8 appointments was performed the anamnesis, the speech and communication skills assessment and the observations of child in the natural environment (home and nursery school). Once in each calendar quarter the treatment is reassessed. Applied Behaviour Analysis is used during the treatment. The method uses the approach of antecedents-behaviour-consequences to respond to behaviour in a natural environment. The positive behaviours and learnt skills are reinforced. It should be stressed that the child is praised not only for the effects of activity, but also attempts to complete the task. The speech and language therapist focuses on deficits in prosodic, segmental and suprasegmental features of language. Fine motor imitation, then oral motor imitation and finally vocal imitation are taught at the earliest stage of the treatment. The vowels, exclamations and onomatopoeias occurred. It enables the occurrence of expressive speech acts and communicates intent before speaking first words. i.e./ooo!/to express pleasure, excitement or astonishment/aaa!/to comprehension or confirmation/eee!/to negation; onomatopoeia words to name objects or actions. The child began to utter Consonant-Vowel forms and then holophrases and own name. The movements of speech articulators are also improved. The child is instructed to look at the therapist’s face in order to remember correct production of speech sounds. Additionally, the hearing perception and phonological awareness is increased during the active listening training. A CD, which consists of recorded consonants in initial [CV], medial [VCV] and final [VC] position, is listened for 20 minutes/day by the child. The prepared material improves speech production. Hyrax Expander is recommended to repair high palate. The treatment of expressive language disorders is effective, but the skills are still not solid. In order to increase social interaction, school performance and feeling of self-worth, the Augmentative and Alternative Communication is introduced and the Picture Exchange Communications System is applied. The child is taught to communicate, be more persistent communicator, select things, construct simple sentences, and answer the question and comment in response to questions. The system is used in the nursery school and clinic setting as well as in the home. The special education professional practises the language comprehension. The vocabulary is improved and expanded. The taught vocabulary is connected with everyday objects, actions, events, person, natural phenomena, quantities, material; then verbs and adjectives, few adverbs, numerals and prepositions of place, movement and time. The material is based on the rules of morphology, syntax and speech sounds which occur in the typical phonological development. The operational competences are also practised. The exercises include visual discrimination, matching, distinguishing, classifying, memory, attention, and motor planning and switch activities. Emotion expression is practised. The following activities are used: understanding, recognizing and naming the emotions on pictures, matching the situations to emotions, showing and communicating emotions in the socially accepted way, communicating feelings. Additionally, the child learnt how to develop positive relationships and work in team. The Dandy Walker Syndrome cannot be cured or repaired; therefore, the treatment should focus on individual needs, symptoms and difficulties. The treatment requires work in a multidisciplinary team of speech and language therapist, behavioural therapist and special education professional. The aims and objectives of speech-language treatment for individuals with Dandy Walker syndrome depend on the nature of speech and language disorders; however, it should focus on developing the communication skills. The malformation of cerebellum may result in receptive, expressive or mix receptive-expressive disorders, therefore, an intensive treatment for correction of those disorders should be applied. In order to increase the process of communication the Augmentative and Alternative Communication may be used. Applied Behaviour Analysis enables to learn positive and learnt behaviour and reduce negative one. Brodsky MC (2016) Pediatric Neuro-Ophthalmology. New York: Springer. Volpe J (2008) Neurology of the New-born. 5th edn. Philadelphia: Saunders Elsevier. Nyberg DA, McGahan JP, Pretorius DH, Pilu G (2003) Diagnostic Imaging of Fetal Anomalies. Philadelphia: Lippincott Williams & Wilkins. Malcom I, Levene FA (2008) Fetal and Neurology and Neurosurgery. Toronto: Churchchill Livingstone ELSEVIER. James DK, Steer CP, Weiner BG (2011) High Risk Pregnancy: Management Options. 4th edn. Philadelphia: Saunders Elsevier. Doubilet PM, Benson CB (2003) Atlas of Utrasound in Obstetrics and Genecology: A Multimedia Reference. Philadelphia: Lippincott Williams & Wilkins. 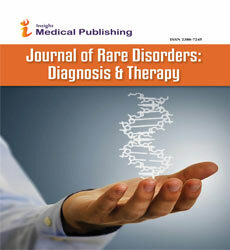 Suro M (2011) Genetics of neurodevelopmental anomalies. In: Levene MI, Frak AC (eds) Fetal and Neonatal Neurology and Neurosurgery. 4th edn. Toronto: Churchchill Livingstone ELSEVIER: 266-290. Leestma JE (2009) Forensic Neuropathology. 2nd edn. Boca Raton. New York: Taylor & Francis Group. Brodsky MC (2016) Pediatric Neuro-Ophthalmology. 3rd edn. New York: Springer.